"This is a gathering of Lovers. no grand discourse, no proper schooling required. There is no master, no disciple. full of tricksters, fools, mad men and mad women. This is a gathering of Lovers." To Jalaluddin Rumi, the 13th century sufi poet-mystic, intoxication and particularly, "love," can only be understood in its divine, all-encompassing manifestation, a form of spiritual "yearning" which is familiar to all spiritual seekers. For Sufis, this "yearning" is highly celebrated, and given the outer forms of "Lover" and "Beloved." On October 15th, 2011, we will be launching a new website called "One Through Love: A Gathering of Lovers," to remind people around the world that love (Askh in Turkish, Eshgh in Persian) is the singular force that underlies and connects all creation. One Through Love will be the first cinematic, multi-lingual website which uses the poetry and teachings of Jalaluddin Rumi to spread the unifying message of love, in English, Persian, Arabic and Turkish. 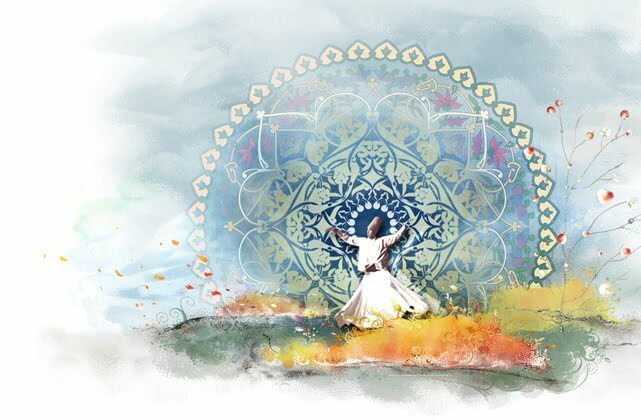 One Through Love is truly "a gathering of lovers," since it presents an international gathering of Rumi "lovers" -- scholars, musicians, dervishes and other sufi practitioners from Turkey, Iran, Europe and the US. Each film segment shown on the website is subtitled in four languages, so that people in different countries will be watching and responding to the same film material. They will be sending in responses, comments and questions and meeting other "lovers" from the Arab, Persian, Turkish, European and North American worlds. Truly a translator's dream! One Through Love is a unique experiment, though not one without some precedent. It was 44 years ago, that the birth of the satellite era made possible the first, live, global television transmission. The BBC put up The Beatles' "All You Need is Love" (on June 25th, 1967) connecting a string of satellites, across the globe, ultimately reaching an astounding audience of 400 million people in 26 countries. On Saturday, October 15th, (at 11:50 a.m. PST, 2:50 p.m. EST; 7:50 p.m. GMT) the One Through Love project will be using the power of film and music, together with modern, low-cost digital and internet technologies to send out essentially the same message, the same affirmation. there is no irreverence or faith. and you will not be separated again. One Through Love hopes to create a yearning for people to reach out and get to know each other, especially "the other," those who have been labeled "evil" or "satanic," those who have been so misunderstood. One Through Love will become a meeting place for those who hear Rumi's message, and want to share their comments and questions about love, life and the forces that connect us all. As a "sneak preview," over the next week, we will be presenting a sample glimpse of these "lover-teachers," which will hopefully please and inspire, leading right up to October 15th, when, at 11:50 a.m. PST; 2:50 p.m. EST; 7:50 p.m. GMT, One Through Love will be launched as a local/national/global event. Locally, One Through Love will premiere as a film at the Mill Valley Film Festival, at a festival screening timed exactly to coincide with the national television broadcast on satellite channel Link TV (Direct TV ch. 375; Dish Network Ch. 9410), coinciding precisely with the live streaming of the film, with follow-up global discussion, on the project website: www.OneThroughLove.org. Here is a video clip of Parisa Soultani, the project website host, chief translator and co-producer, extending the invitation to join this "gathering of lovers," in Turkish, Persian, Arabic and English. Immediately following the one-hour film, (at 1:00 p.m. PST; 4:00 p.m. EST; 9:00 p.m. GMT) website host Parisa Soultani will moderate the follow-up global discussion. From the Rafael theater, live video connections will be made with Cemalnur Sargut, a Turkish lover in Istanbul, Mahmoud Mostafa an Arab lover in Jakarta and Dr. Omid Safi a Persian lover in North Carolina, who will all engage and converse with Robert Abdul Hay Darr and Llewellyn Vaughan-Lee, our American and British lovers in the film festival theater. The dialogue will be projected live in the theater, and steamed live, globally, through the www.OneThroughLove.org website. Why Rumi? When UNESCO declared 2007 as "the year of Rumi," they were recognizing Rumi's contribution as an advocate of inter-faith tolerance and respect. "One of the great humanists, philosophers and poets who belong to humanity in its entirety". Beyond this cross-over appeal, the UN recognized that the spiritual evolution and perhaps the very survival of our world, especially since the events of 9/11 and thereafter, is directly tied to the teachings of tolerance, acceptance and unity consciousness that lie at the heart of Rumi's writings. Please join us throughout this week, to meet some extraordinary "lover-teachers" who form the inner circle of One Through Love's "gathering of lovers".